On my first day out on the Isle of Man I drove to the Langness Peninsula, for a first light house watch. I had to ask my way several times. I could see the lighthouse, but could not seem to find the road that would lead me to it. So after crossing a golf course several times (there was a small road, I did not actually race over their green!) with the risk of having the car hit by a golf ball, I finally found the tiny road that lead to the lighthouse. After taking the obligatory pictures, I sat down on a rock beside it and found the book that was given to me by a good friend as a part of an Isle of Man “chill pack”. Well it didn’t get any more chilling than this. There were no people whatsoever to spot anywhere near me, the sun was shining, I had a lighthouse just beside me on my left, and in front of me was a very calm sea. It was quiet and peaceful, all I could hear were some birds. I started reading. I was completely lost in my book when my ears picked up a peculiar sound. It sounded like someone snorting, and no, unfortunately, it wasn’t him. I couldn’t quite see where it came from at first, until I looked right in front of me, and there he was – a seal! He kept me company for a couple of hours, diving down once in a while for a bite to eat, and popping up again for some air. If you look carefully at the photo you can see him waving his paw. I asked him to do that, because it would make such a cute photo. He was happy to do so. His name? No this wasn’t Bill, but Sam, his brother. Sam was not the last seal I saw on the isle. I think I have seen seals every day. I saw quite a lot of them near Sound (also in the south) and the handsome fellow in the middle (number 3 and that is Sam’s brother Bill indeed) came greeting me in the harbour of Peel. 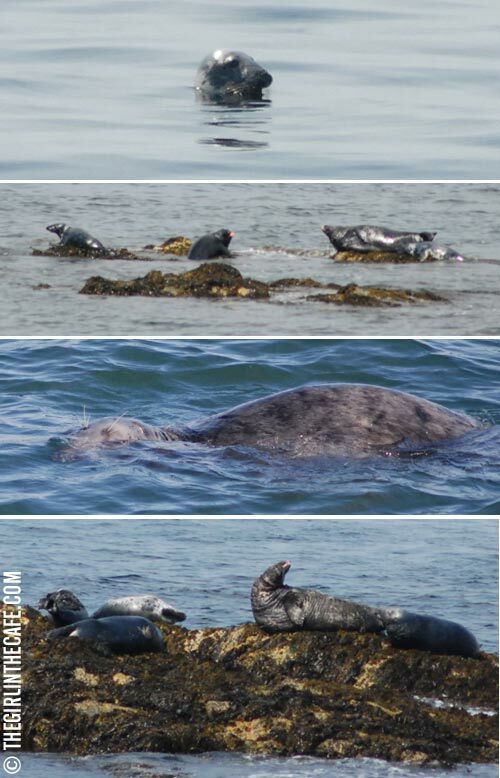 Seals are a very common sight all around the island, but they kept Wow’ing me every single time. It is so cool to see them in their natural environment.